Not the whole of Africa is influenced by malaria. Most parts of South Africa is malaria free with the exception of far northern Kwazulu Natal and some areas of the Kruger during certain times of the year. The Kruger is a medium-risk area most of the year, but precautions still need to be taken, especially during the summer months of October to April. With proper malaria prevention in place, you can have a great holiday. There are many other popular holiday destinations across the world that has malaria. South East Asia, South America and India are some of the destinations that come to mind. If proper precautions are taken, malaria shouldn't be a factor in your decision to go on safari! TIP: There are safaris and tours to malaria-free areas for those who prefer to avoid the risk of malaria. See malaria-free areas below. Don't let malaria keep you from enjoying a safari in Africa. 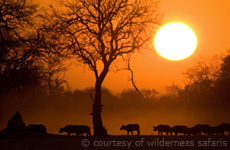 There are several malaria-free game reserves in South Africa to choose from. Addo Elephant, Kwandwe, Shamwari, Welgevonden and Madikwe are to name but a few. Please contact us for detailed information on the lodges in these reserves and national parks. » Get good advice on malaria prevention with oral antimalarial medicine before you depart for your holiday. Visit your local doctor 4-6 weeks before travelling into a malaria area. » Take the oral antimalarial pills on the same day each week when weekly, or at the same time of the day if daily. Continue prophylaxis for 4 weeks after your return. A children's version of the antimalarial drug Malarone is available. The most important malaria prevention and precaution against being bitten by mosquitoes is to cover up and to apply insect repellent. Your kids should have the right gear for their safari. Long sleeved shirts and long trousers are essential for early morning and evening. A child-friendly high concentration DEET repellent is available on the market. Symptoms of malaria include fever and flu-like illness, including shaking chills, headache, muscle aches and fatigue as well as general tiredness. Nausea, vomiting and diarrhea may also occur. In some cases malaria may cause yellow coloring of the skin and eyes because of the breakdown of red blood cells. The first malaria symptom normally shows anywhere between 10 days to 4 weeks after infection, although in some extreme cases as early as 8 days and as long as 1 year after infection. Malaria is completely cureable when treated soon after infection. Malaria treatment includes prescription medication. The type of medication and duration of malaria treatment depend on the type of strain of malaria, the area where the patient was infected, the age of the patient and how soon the treatment was started. » British Airways Travel Clinics provide a comprehensive antimalarial avoidance programme. Contact them in South Africa at tel: +27 11 807 3132, and in Cape Town at tel: +27 21 419 3172. Although malaria is a serious and very real threat, we would like to bring it under your attention that The Safari Co. staff travel extensively across Africa and have done so for many years, mostly in high risk malaria areas. We take strict antimalarial precautions while travelling in malaria areas and have been fortunate enough to never get malaria. The most important fact to remember is that prevention is better than cure. With adequate malaria prevention in place, a safari to Africa's most beautiful 'spots' are easier than you think!